The Global Volcanism Program has no activity reports for Escorial. The Global Volcanism Program has no Weekly Reports available for Escorial. The Global Volcanism Program has no Bulletin Reports available for Escorial. Cerro Escorial, a small andesitic-dacitic stratovolcano, has young-looking lava flows and a well-preserved crater. It is the youngest volcanic center of the NW-SE-trending Corrida de Cori range that marks the Chile/Argentina border. Escorial is located 4 km NE of an active sulfur mine in older, extensively hydrothermally altered rocks. Very youthful-looking lava flows extend westward 3-4 km over an ignimbrite deposit on the Chilean side. A 1-km-wide crater caps the summit. Escorial was considered by de Silva and Francis (1991) to be of probable Holocene age based on morphological evidence, but Richards and Villeneuve (2002) obtained an Ar/Ar age of about 0.342 million years on a lava flow. Most of the lava flows extend to the SW into Chile, but a few small lobes traveled NE on the Argentinian side of the volcano. De Silva (2007 pers. comm.) noted that the well-preserved summit crater postdates the lava flow and could be of Holocene age. Richards J P, Villeneuve M, 2002. Characteristics of late Cenozoic volcanism along the Archibarca lineament from Cerro Llullaillaco to Corrida de Cori, northwest Argentina. J. Volcanol. Geotherm. Res., 116: 161-200. The Global Volcanism Program is not aware of any Holocene eruptions from Escorial. If this volcano has had large eruptions (VEI >= 4) prior to 10,000 years ago, information might be found on the Escorial page in the LaMEVE (Large Magnitude Explosive Volcanic Eruptions) database, a part of the Volcano Global Risk Identification and Analysis Project (VOGRIPA). There is no Deformation History data available for Escorial. There is no Emissions History data available for Escorial. 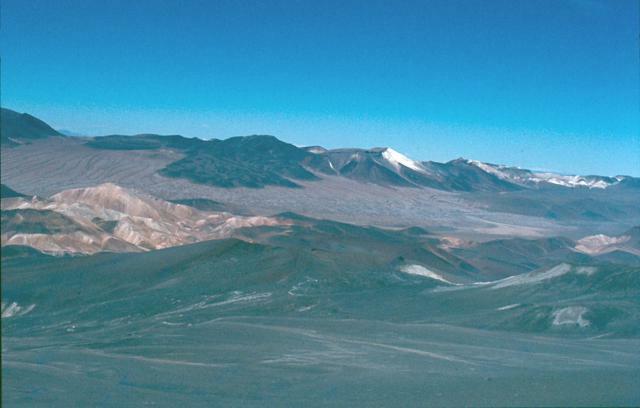 Cerro Escorial (center horizon), viewed from the summit of Lastarria volcano, is a small andesitic-dacitic stratovolcano that straddles the Chile/Argentina border. Very youthful-looking lava flows of uncertain age are seen here extending 3-4 km SW-ward over an ignimbrite deposit on the Chilean side of the border. Cerro Escorial is located 4 km NE of an active sulfur mine in older, extensively hydrothermally altered rocks, some of which are seen in the middle ground. Photo by José Naranjo, 1983 (Servico Nacional de Geologica y Mineria). There are no samples for Escorial in the Smithsonian's NMNH Department of Mineral Sciences Rock and Ore collection. Large Eruptions of Escorial Information about large Quaternary eruptions (VEI >= 4) is cataloged in the Large Magnitude Explosive Volcanic Eruptions (LaMEVE) database of the Volcano Global Risk Identification and Analysis Project (VOGRIPA).